I have received countless emails from Hashimoto’s readers who have started feeling so much better after digging at their own root cause, making adjustments to their diets and lifestyles, and finding supplements that restore the nutrient depletions which are so common with thyroid disorders. Selenium, iron, Vitamin A, Vitamin E, the B vitamins, potassium, iodine, and zinc are all required for proper thyroid function. Other nutrients, although not directly involved in thyroid function, are also essential for optimal immune system, gut, liver and adrenal function. Most people who are diagnosed with Hashimoto’s will also present with low levels of selenium, Vitamin E, and glutathione, as well as zinc and ferritin (the iron storage protein). One of the reasons so many of us suffer from nutrient depletions is due to the way that conventional farming methods and food processing are robbing our food supply of good nutrients. In conventional farming methods, the same vegetables are grown on the same soil year after, depleting the soil of nutrients. Vegetables are also harvested before they are ripe and have had a chance to pull all of the nutrients from the soil they were planted in. These conventionally grown vegetables are far less nutritious than organic varieties. I always recommend that people eat organic vegetables, fruit, and meat whenever they possibly can to gain the most nutrition from their food. Poor digestion can be another root cause of nutrient depletion for many people with Hashimoto’s. A person who is deficient in digestive enzymes will not be able to properly extract nutrients from their foods. They could eat large amounts of steak day after day, but if they don’t have enough stomach acid on board, they’re not going to be able to get enough iron out of that steak. Altered gut flora, or dysbiosis, will also prevent the extraction of nutrients from food. Some of the most common medications prescribed to people with Hashimoto’s are notorious for depleting the body of nutrients. These include acid blockers, synthetic estrogens, progesterone (such as the birth control pill) as well as antibiotics. Many of the diets that people with hypothyroidism follow to help relieve their symptoms can actually be a root cause for nutrient depletions. Going gluten-free or Paleo can have a substantial, positive effect on people with thyroid disorders, but it can also eliminate some essential vitamins from the diet, including the B vitamins, that will need to be supplemented. Vegan, vegetarian, and low-fat diets will, likewise, put us at risk for deficiencies, including Vitamin A, Vitamin B3, Vitamin B9, Vitamin B12, Vitamin D, calcium, chromium, copper, iodine, iron, magnesium, manganese, zinc and omega-3’s. Additionally, hypothyroidism, in itself, will lead to poor extraction of minerals and vitamins from our food sources. Thyroid hormones determine our metabolism throughout the entire body, including the digestive tract. Lack of sufficient thyroid hormones makes nutrient extraction more difficult and less efficient, and can lead to nutrient deficiencies. Vitamin B12 is an essential water-soluble vitamin that is commonly found in animal proteins such as fish, shellfish, meat, eggs, and dairy products. B12 is required for protein synthesis, cell reproduction, and normal growth. The risk for Vitamin B12 deficiency is higher with increased age. It has also been found to be more prevalent in males and in people of Caucasian and Latin American descent. It results from insufficient intake, malabsorption from food, and other medical conditions that may prevent absorption. 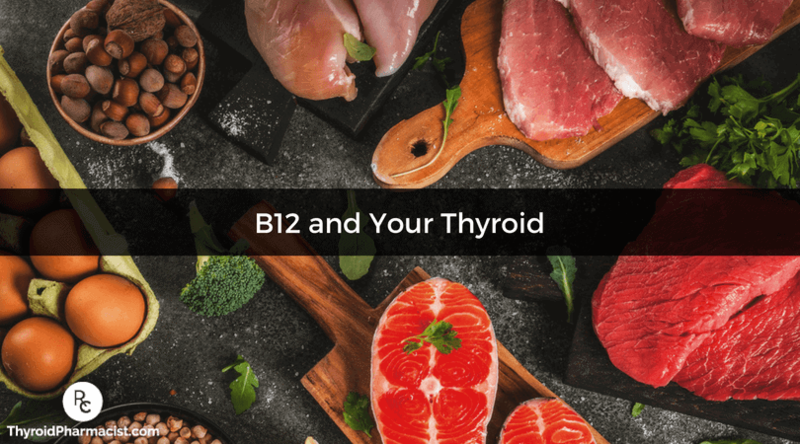 In the case of people with thyroid disorders, a B12 deficiency is often a result of damage to the digestive tract that prevents the absorption of vital nutrients. B12 is released for absorption with the help of hydrochloric acid (stomach acid) and protease, an enzyme in the stomach. Low levels of hydrochloric acid, commonly found in those with Hashimoto’s, put people at risk for B12 deficiency. The consumption of bread and cereals fortified with folic acid (synthetic folate) may mask this deficiency on standard lab tests. Because Vitamin B12 is only found in animal proteins and not in plant foods, those that have been following a vegetarian or vegan diet are at an especially high risk for developing a B12 deficiency. Taking a Vitamin B12 supplement is essential for vegans, and may be helpful for those with low stomach acid until the condition is corrected. If you have a thyroid disorder, there is a very good chance that you are not absorbing B12, even if you eat a diet rich in animal proteins. Along with removing problematic foods and supplementing with Betaine with Pepsin to restore healthy gut function, adding in a B12 supplement may go a long way to restoring your energy, cognitive function and overall sense of well-being. Most people with thyroid conditions and adrenal fatigue will also have low stomach acid (hydrochloric acid or HCl), which is necessary to break down protein. This is known as “achlorhydria”. This lack of adequate digestive enzymes leads to a depletion of amino acids, iron, zinc and other nutrients obtained from protein. Symptoms include gas, heartburn, bloating, and heaviness in the stomach after eating a protein-rich meal. Achlorhydria and the inability for the digestive tract to break down and absorb many important nutrients can result in severe deficiencies for many people who have hypothyroidism. Another risk factor for B12 deficiency is small intestinal bacterial overgrowth, commonly known as SIBO, which may be present in up to 50% of people with Hashimoto’s. Do You Have Low Levels of B12? Lab tests for measuring B12 levels are available but do not always tell the whole story. Established “low” ranges are too low, and researchers have found that “normal-low” B12 levels have been associated with neurological symptoms such as difficulty balancing, memory lapses, depression, mania, fatigue, and even psychosis! Normal serum Vitamin B12 levels range between 200-900 pg/mL, with concentrations less than 200 pg/mL usually resulting in deficiency. B12 deficiency may result in gastrointestinal lesions, and neurological damage, as well as symptoms such as depression, memory loss, weakness, personality and mood changes, and impaired cognitive performance. Impaired digestion and inflammation are also symptoms of a B12 deficiency. An elevation of B12 in your serum can be tied to the MTHFR gene variation. When the body is unable to properly use B12, it will show up as elevated on the test. As B12 is a water soluble vitamin, any amount that is not used by the body will simply be eliminated. To find out if you have low levels of B12, you can ask your health care provider for the B12 (or cobalamin) test. This test can be ordered individually or added to a blood panel. Your levels may be low, even if all other screening tests for iron and anemia come out within the reference range. Alternately, you can self-order the B12 test via Ulta Lab Tests. When you receive your test results, it’s important to note that optimal B12 levels should be between 700-900 pg/ml. Most labs will not flag B12 levels unless they are under 200 pg/ml. Options for B12 replacement include tablets, sublingual (under the tongue) liquids, and injections. I prefer the sublingual route as there may be advantages for those with absorption issues, and it is more convenient than injections. Sublingual doses of 5 mg (5000 mcg) of B12 daily for ten days, then 5 mg once per week for four weeks, then 5 mg monthly, have been found to be effective in restoring B12 levels in those with a deficiency. 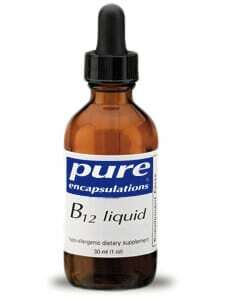 Pure Encapsulations B12 comes in a convenient liquid form that can be administered sublingually for optimal absorption. The active form of B12 in this formulation is highly bioavailable and has been shown to support neurological function, nerve cell health, healthy cognitive and nerve function, as well as memory and emotional well-being. Vitamin B12 is also an important co-factor for energy production and plays a role in immune system health and healthy homocysteine metabolism. Homocysteine is a naturally occurring amino acid found in blood plasma. High levels of homocysteine in the blood are believed to increase the chance of heart disease, stroke, Alzheimer’s disease, and osteoporosis. For this reason, I highly recommend optimizing your B12 levels today! For more information on nutrient depletions and Hashimoto’s, I encourage you to read the articles What’s Going on in Hashimoto’s, Nutrient Depletions Part I: Selenium, Nutrient Depletions Part II: Nutrient Extraction, and Hair Loss and Your Thyroid. My latest book, Hashimoto’s Protocol goes further in depth on strategies for getting to the root cause of your thyroid disorder and addressing nutrient deficiencies so you can start feeling better. I wish you well on your journey to health! P.S. Be sure to sign up for my weekly newsletter to get a free book chapter, recipes, Thyroid Diet Starter Guide and notifications about upcoming events and my latest research. Vitamin B12. Therapeutic Research Center website. https://naturalmedicines-therapeuticresearch-com.mwu.idm.oclc.org/databases/food,-herbs-supplements/professional.aspx?productid=926. Updated March 7, 2018. Accessed March 22, 2018. Ness-Abramof R, Nabriski DA, Braverman LE, Shilo L, Weiss E, Reshef T, et al. Prevalence and evaluation of B12 deficiency in patients with autoimmune thyroid disease. Am J Med Sci. 2006 Sep;332(3):119-22. Note: Originally published in February 2015, this article has been revised and updated for accuracy and thoroughness. B12 supplements generally come in either of two forms, cyanocobalamin or methylcobalamin. The cyano- type is generally cheaper and easier to find, but I’ve read elsewhere that the methyl- type is nutritionally superior, kind of like the difference between artificial folic acid, commonly found in highly processed foods like bread, and the natural folate that is found in real food. I don’t know how important the difference is, but I always buy supplements that list the methylcobalamin form of B12 on the label. Greg – thank you for sharing what has worked for you! ;) I hope you keep me posted on your progress here. Can you please help me. I am 29 years old. I feel very sick. My hair is falling out in clumps. I had to drop out of college due to being so sick. After comparing my lab ranges to optimal ranges some are very low. Last “functional” doctor told me everything was normal. But I do not feel normal. I have spent so much money seeking answers. But do not know where to turn now. This full panel was done in September. What do I do? T3, REVERSE, SERUM (20) 8 – 25 ng/dL *2 = Low? My results are in parentheses. The lab ranges are beside them. Jen – thank you for reaching out! <3 I am so sorry to hear about your struggles. Don't give up! Hashimoto’s often is a combination of food sensitivities, nutrient deficiencies, adrenal issues, gut issues as well as an impaired ability to get rid of toxins. Any of those things would prevent a person from getting better. If you need further support, please check out the list of lab tests inside the “Testing” chapter of my book, Hashimoto’s Root Cause. I also offers a 12-week program, Hashimoto's Self Management Program. I hope this helps, please keep me posted on your progress here! Here are some links to articles and resources I hope you find helpful. Does this information apply if I don’t have a thyroid? Had it removed in 1979. Cindy – thank you for reaching out! Most thyroid conditions result from the immune system attacking the thyroid because the immune system is out of balance. Even when the thyroid is taken out surgically or treated with radioactive iodine the autoimmunity still persists in most cases. Many people will have their thyroids removed, and will develop new autoimmune disorders such as Lupus, Rheumatoid arthritis, etc. The immune system just finds a different target. Hi Dr. Wentz! I tried Betaine HCL (Thorne) for a few days, just one per day. Somehow, the capsules caused a 2nd degree burn at the back of my throat that formed a large blister. Ugh! Do you know if digestive bitters could be used instead of Betaine HCL to help low stomach acid? Jen – thank you for sharing your journey! I am so sorry you had this issue with the Betaine. It would not be legal or appropriate for me to give any type of medical advice here. I highly recommend that you work with a functional medicine clinician to be a part of your own health care team. It’s an entire medical specialty dedicated to finding and treating underlying root causes and prevent serious chronic disease rather than treating individual disease symptoms. Here are some resources you may find helpful. Hi I am 29 and diagnosed with Hashimoto a few weeks ago. I am currently reading your protocol book, on the liver support protocol. I have a few questions with regards to supplements and when I can take them, as much as I would love to purchasing all the suggested supplements I cannot afford to, is there one or two in particular that combines some together? And can you take them at any point of the day with one another? And I also have a sweet tooth when it comes to the evening I’m finding it so hard to not eat something.. are things like sorbet ice cream, or yogurt and nuts of an evening a no go? HI I have thyroid alteration i am not taking any medicine right now before 6 months i got high tsh level and low iron level. I started ayurvedic medicine and took iron sucrose injections. That after taking 3 month medicine thyroid became normal. But totake when i checked b12, d3 and TFT, b12 and d3 are low and only tsh is high t3 and t4 are normal so what i have to do? Hello. I am 71 and have been dealing with Hashimoto’s for about two decades. I cannot seem to take any form of B12 because the tip of my tongue becomes very sore. I have been taking Armour but suddenly, when refilling the prescription, my thyroid began to swell every time I took it. I had to cut back more than 50%. Cutting back helped get rid of some symptoms like racing & flip-flopping heart beats. Dr. then did an ultra sound but wasn’t too concerned about results. My biggest problem is that I can’t sleep at night more than about 3 1/2 – 4 hrs. max for all these years, and that’s with sleeping pills. Do you have any idea why I can’t take B12? Other vitamins give me headaches so I must attempt to get through foods. Sensitive to a lot of foods & meds. Judy – thank you for reaching out and sharing your journey. Not all supplements are created equally and you may be using a brand that contains fillers and additional ingredients that could be causing a reaction. <3 Did you know that reactive foods trigger an inflammatory response in the GI tract, leading to malabsorption of nutrients (gluten sensitivity, in particular, has been implicated in causing a Selenium deficiency, a well-known risk factor for Hashimoto's), and can also produce intestinal permeability whenever they are eaten? Most people will see a dramatic reduction in gut symptoms, brain symptoms, skin breakouts, and pain by eliminating the foods they are sensitive to. Some will also see a significant reduction in thyroid antibodies! An additional subset of people will actually be able to get their Hashimoto's into complete remission just by getting off the foods they react to, normalizing their thyroid antibodies, and some even normalizing their thyroid function! Here are a couple of articles you may find helpful as well. Would this apply if you have secondary hypothyroidism due to panhypopituitarism caused by a pituitary tumor? Thank you for your nice website. My wife’s thyroid gland is a little sluggish. She is 30 years old and her thyroid disorder was diagnosed 5 years ago. 7 months ago, she felt numbness, tingling and pain in her hand and leg. A blood check revealed that her B12 level was 247. Her doctor prescribed B12 (1000 microgram/ml) shots, one a weak for first month, and one a month for 4 months. Several days after taking the first shot, all symptoms disappeared. Everything was fine until 2.5 months after the last shot, when she started feeling numbness in her hand again. According to her new blood check, her B12 level is 284 which is low again. 1- What is the best way of taking B12 for her to maintain the B12 level in the optimum range? 2- what is the optimum B12 range for her? 3- I read that the hypothyroidism can cause B12 absorption problems. But since her hypothyroidism has been treated for 5 years, I expected she must not have digestion problems associated with hypothyroidism. Despite my expectation, she seems to have B12 absorption problems. Why ? Cannot we cure her digestion problem so that she doesn’t have to take B12 supplements anymore ? Can her digestion problem be the result of incomplete hypothyroidism treatment? Maybe her hormones are only partially balanced. It will be highly appreciated if you help me find out the truth. Hossein – thank you for reaching out and sharing your wife’s journey. <3 My heart goes out to her. Low stomach acid is very common in Hashimoto’s. Signs and symptoms that would lead me to believe that a person with Hashimoto’s had low stomach acid include: acid reflux symptom (this condition that is conventionally treated with acid suppressants can actually be caused by low stomach acid), low B12, ferritin, or iron levels, fatigue despite thyroid medications and constipation/diarrhea. Gut healing is a journey; she may need various interventions like removing reactive foods and infections, taking enzymes and probiotics, and balancing nutrients. Remind her to be kind to herself and learn to listen to her body so that she can support and feed it properly! Here are some articles that might be helpful as well.